After you order the window net you must email us a detailed diagram or ideally mail us a cardboard template. Average lead time is 4 weeks to make them. 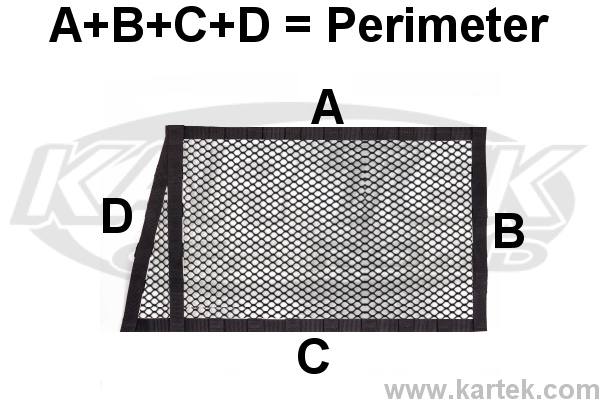 The price and size of the window nets is based on a perimeter dimension. If you add up all sides of the net you will get a perimeter dimension. See diagram. Standard price is for a thru-rod or button snap-on style net. Circular grommets are an additional cost per grommet. It is YOUR responsibility to contact the sanctioning body of your race event to find out what they CURRENTLY require for SFI Certification, thru-rod, snap-on or grommet style window nets. The rules constantly change per year and per race class.